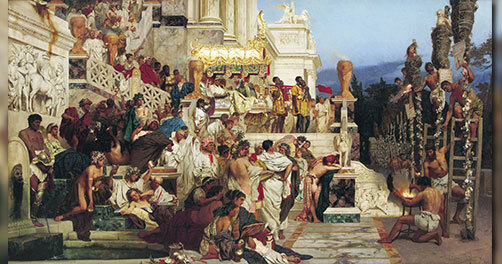 “…Now started the most terrible and destructive fire which Rome had ever experienced. It began in the Circus, where it adjoins the Palatine and Caelian hills. Breaking out in shops selling inflammable goods, and fanned by the wind, the conflagration instantly grew and swept the whole length of the Circus. There were no walled mansions or temples, or any other obstructions, which could arrest it. First, the fire swept violently over the level spaces. Then it climbed the hills – but returned to ravage the lower ground again. It outstripped every counter-measure. The ancient city’s narrow winding streets and irregular blocks encouraged its progress. Terrified, shrieking women, helpless old and young, people intent on their own safety, people unselfishly supporting invalids or waiting for them, fugitives and lingerers alike – all heightened the confusion. When people looked back, menacing flames sprang up before them or outflanked them. When they escaped to a neighboring quarter, the fire followed – even districts believed remote proved to be involved. Finally, with no idea where or what to flee, they crowded on to the country roads, or lay in the fields. Some who had lost everything – even their food for the day – could have escaped, but preferred to die. So did others, who had failed to rescue their loved ones. Nobody dared fight the flames. Attempts to do so were prevented by menacing gangs. Torches, too, were openly thrown in, by men crying that they acted under orders. Perhaps they had received orders. Or they may just have wanted to plunder unhampered. Nero was at Antium. He returned to the city only when the fire was approaching the mansion he had built to link the Gardens of Maecenas to the Palatine. The flames could not be prevented from overwhelming the whole of the Palatine, including his palace. Nevertheless, for the relief of the homeless, fugitive masses he threw open the Field of Mars, including Agrippa’s public buildings, and even his own Gardens. Nero also constructed emergency accommodation for the destitute multitude. Food was brought from Ostia and neighboring towns, and the price of corn was cut to less than ¼ sesterce a pound. Yet these measures, for all their popular character, earned no gratitude. For a rumor had spread that, while the city was burning, Nero had gone on his private stage and, comparing modern calamities with ancient, had sung of the destruction of Troy. By the sixth day enormous demolitions had confronted the raging flames with bare ground and open sky, and the fire was finally stamped out at the foot of the Esquiline Hill. But before panic had subsided, or hope revived, flames broke out again in the more open regions of the city. Here there were fewer casualties; but the destruction of temples and pleasure arcades was even worse. This new conflagration caused additional ill-feeling because it started on Tigellinus’ estate in the Aemilian district. 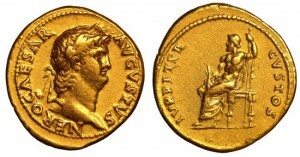 For people believed that Nero was ambitious to found a new city to be called after himself. Tacitus was a historian and a senator, but much of his personal life is unknown, including exactly where and when he was born. He was probably born in 56 or 57, to a family of the equestrian order, and possibly in the northern Italy or the province of Gallia. As such, if he was in Rome at the time of the Great Fire, he would have been only seven or eight years old, and the Annals were written 52 years after the event, so his account is likely second-hand. He did, however, study rhetoric in Rome at an early age to prepare for a career in law and politics, so he could have been in the city at the time. It is very unlikely Nero started the fire, based on some of the accounts of his willingness to get in the chaos and help evacuate and shelter people. Also, the fire partially destroyed his own palace, the Domus Transitoria, which he rebuilt into the Domus Aurea, and replaced some of the destroyed art. The rumor about the Christians was likely started by Nero to scapegoat someone as the other rumors about him starting it were rampant. To appease the masses, Nero had Christians burned alive or fed to the lions in the remaining amphitheater, during the spectacles held while the city was being rebuilt.